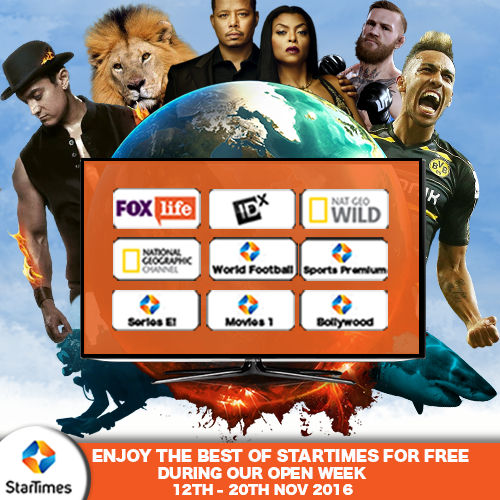 The StarTimes open week continues, up until this coming Sunday, the 20th of November. During the open week, which started on the 12th of November, Startimes opened some of their 9 top entertainment channels to their customers as well as the general public. “Every household including those with the StarTimes free to air decoders to sample our enriched content at no cost,” said Mr. Lisboa. Other channels that have been available during the open week were IDX, Bollywood Africa, Nat Geo wild, ST Movies, Fox Life, ST Series E1. The brand continues to offer relevant and competitive programming at affordable subscription fees from as low as Ksh 259 for Nyota and Ksh 1,499 for the Unique/ Super package.